In the Mediterranean we try to use all natural products with a deep history of its beneficial uses, instead of relying on man or factory-made ones. This was, of course, primarily dictated initially due to the region’s lack of buying power and remoteness. But, as the people of these regions slowly gained in wealth and imported products began permeating the local markets, some traditions stay true. Rosewater is one of them. Rosewater is one of those truly multifaceted products which are used in the kitchen to sweeten foods, as well as in the bathroom and bedroom as a beauty and healing product. Best of all, the luxurious scent of this marvelous little water adds a bit of zest to your cooking without breaking the bank. The cost is under $5.00 for a 12 ounce bottle. The homeopathic roots of rosewater date as far back as the ancient Egyptians. According to legend, Cleopatra would take milk baths with rose petals floating to keep her skin soft, smooth and gloriously scented. Even in recent times, it is said the streets of Beirut are filled with the scent of rosewater in the late Spring and early Summer, as the rose petals are pressed, steamed and distilled to make this many faceted beauty and food product. Rosewater is typically spritzed on the faces of women with sensitive skin or rosacea, due to its anti-inflammatory, anti-bacterial and anti-oxidant properties. For those with acne, applying rosewater as a tonic reduces the amount of bacteria on the skin. So it makes an excellent, all natural toner for skin that has broken out due to excess oils. Even for those of us who don’t necessarily have problematic skin, rosewater is a gentle, fabulous pick-me-up. The scent awakens your senses better than coffee (well, that may be a stretch, but it does work). 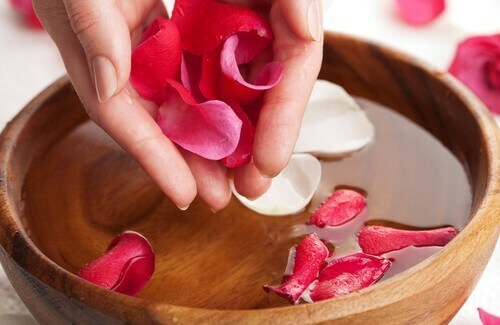 Rosewater enjoys a natural aromatherapy healing to elevate your senses. Rosewater is refreshing, inexpensive and luxuriously scented; keeping skin soft and hydrated – which is important for all skin types at any age. While some men may scoff at smelling like roses, let me point out that rosewater is an excellent aftershave. It stems from the very same reason that rosewater is good on sensitive skin: it helps to calm irritated skin. And don’t worry about smelling like a girl: the rose scent is light and generally dissipates off skin within the first 30 minutes. The calming, luxurious effect that rosewater has on your skin can have the same effect on your other senses. After a long, busy day, a deep bath in hot water with a few drops of rosewater and any essential oil (my personal favorite is Jasmine) relaxes even the most stressed out Type A out there. Best of all, you go to bed smelling like a bed of roses – with the added bonus of softer, brighter skin. Try spritzing your sheets with a bit of rosewater to release the Aphrodite within. In addition to using rosewater for beauty purposes, try adding a splash of rosewater in the kitchen for a refreshing twist on simple salads. Give your freshly laundered clothes a little goddess love. Spritz folded clothes with a few sprays of rosewater. Your family (and you!) will love it. It makes your entire wardrobe, closet, drawers smell heavenly. Simple pleasures like this go a long way in making one feel luxurious and pampered, without spending a fortune. 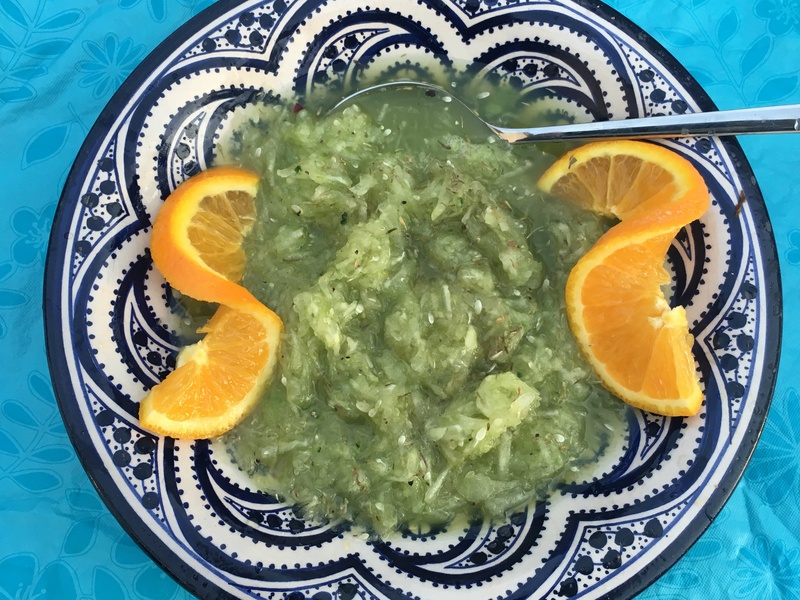 Moroccan Cucumber Rosewater salad is light, refreshing and perfect for cleansing the palate. It is served in most evening meals. Used as both an aperitif and as a digestive, this cucumber dish helps to cleanse the palate in between meals and bites. In a large bowl, shred cucumbers, sprinkle in sugar and stir until fully dissolved. Add mint and rosewater. Place in fridge and allow to cool for 20 minutes before serving. In Greece, with the extreme heat and no one with a ravenous appetite, watermelon and feta is a simple summertime dinner. Add some fresh bread and a dash of rosewater for an island-flair. In a large bowl, combine the above. Enjoy the compliments you will receive on this simple, yet exotic salad. Have I convinced you to give Rosewater a whirl? Do you know of any other fantastic recipes that uses this elixir of the goddesses? If so, I’d love to hear from you. Drop me a comment. I love the smell of roses. The cucumber salad sounds terrific. I make an Egyptian Rose Cookie. It’s so good.